Syncrude, the largest operator of oil sands projects in Canada, was ordered to pay $2.92 million on Friday for causing the deaths of 1,603 ducks. The company was convicted in June by an Alberta court for failing to deploy scarecrows and loud cannons in April 2008 to prevent the migratory birds from landing on a tailings pond containing oily residue from one of its operations. Mike Hudema, a climate and energy campaigner with Greenpeace, said the fine was “no more than a slap on the wrist” considering the size of Syncrude, which produces about 110 million barrels of oil a year. He acknowledged, however, that Syncrude had now been forced to improve its bird deterrence and monitoring. This is just one of many incidents involving wildlife mistaking tar sands oil tailing ponds as safe natural places. Many of these lakes are enormous and pose great risk to wildlife as clearly shown in this massive bird kill. The most disturbing thing about this incident is Synacrude’s neglect. Tar sands operators aren’t taking care of their basic responsibilities and doubtless they are cutting corners elsewhere in order to maximize their profit at others expense. These fines will go to environmental charities, but Mike at Greenpeace has a point; $3 million doesn’t mean anything to a multi-billion dollar company and safety lapses will continue. While conditions have improved here, where else are bad deeds taking place that haven’t been corrected? 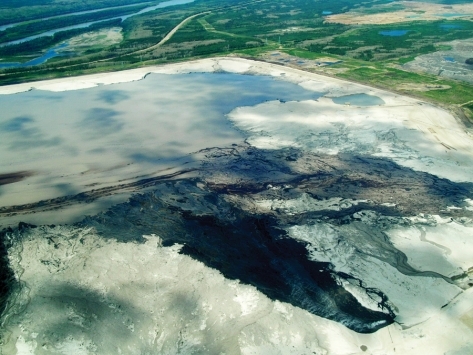 Tailing ponds are one of hundred reasons why tar sands oil is the dirtiest massive energy project on the planet and why it can’t continue.